Astronomers using an international network of radio telescopes have produced a "movie" showing details of the expansion of debris from an exploding star. Their sequence of images constitutes the best determination yet made of the details of a new supernova remnant, and already has raised new questions about such events. The scientists used radio telescopes in Europe and the United States, including the National Science Foundation's Very Large Array (VLA) and Very Long Baseline Array (VLBA), to make very high- resolution images of Supernova 1993J, which was discovered by a Spanish amateur astronomer on March 28, 1993 in the galaxy M81, some 11 million light-years distant in the constellation Ursa Major. Their results are reported in the December 1 issue of the journal Science. The "movie" is based on five images of the supernova, made during 1993 and 1994. The work was done by: Jon Marcaide and Eduardo Ros of the University of Valencia, Spain; Antxon Alberdi of the Special Laboratory for Astrophysics and Fundamental Physics of Madrid, Spain and the Institute of Astrophysics at Andalucia, Spain; Philip Diamond of the National Radio Astronomy Observatory in Socorro, NM; Irwin Shapiro of the Harvard-Smithsonian Center for Astrophysics in Cambridge, MA; Jose-Carlos Guirado, Dayton Jones and Robert Preston of the Jet Propulsion Laboratory in Pasadena, CA; Thomas Krichbaum and Arno Witzel of the Max-Planck Institute for Radioastronomy in Bonn, Germany; Franco Mantovani of the Institute of Radioastronomy in Bologna, Italy; Antonio Rius of the Special Laboratory for Astrophysics and Fundamental Physics of Madrid, Spain and the Center for Advanced Studies at Blanes, Spain; Richard Schilizzi of the Joint Institute for VLBI in Europe and Leiden Observatory in the Netherlands; Corrado Trigilio of the Institute of Radioastronomy in Noto, Italy; and Alan Whitney of the MIT- Haystack Observatory in Massachusetts. The capability to make such high-quality images with widely- dispersed radio telescopes has existed for only a few years. Supernova 1993J was the first one that was both close enough and had radio emission strong enough to enable scientists to make such detailed images. While the circular images show that the explosion debris is expanding symmetrically, the radio emission is stronger on one side of the shell. The explanation for this is unclear. Some astronomers have suggested that the stronger emission could result from the debris interacting with a companion star orbiting the one that exploded. The researchers believe that their sequence of images, with the stronger emission persisting for months after the explosion, makes the companion-star hypothesis unlikely. Previous radio observations of older and larger supernova shells have revealed protrusions within the shell. The latest images, however, show no such protrusions. This places limits on theories of how the protrusions form. 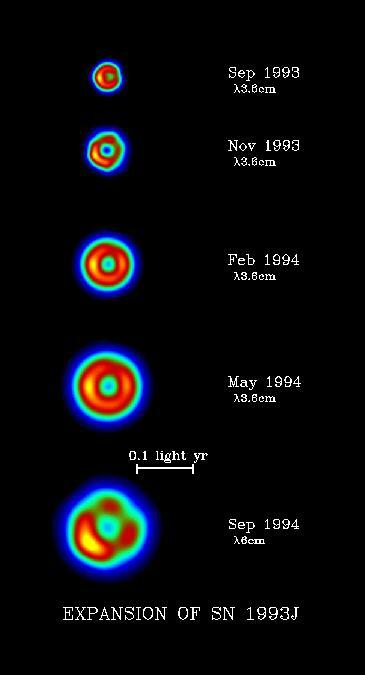 In addition, the new images show that Supernova 1993J's debris shell has shown no signs yet of slowing due to interaction with material surrounding it. The material from the star's explosion is moving at nearly 10,000 miles per second, according to the researchers. At that speed, the material would travel the distance from the Earth to Saturn in one day. When the angular expansion rate of the supernova debris measured by the radio observatories is combined with the expansion speed of the same debris, measured by optical astronomers, it is possible to obtain an accurate value of the distance to M81. The value determined, 11 million light-years, is similar to that obtained by other, independent, means. This is important, as astronomers continue to seek more accurate distances to celestial objects to better gauge the actual size of the Universe. In addition to the VLA and several antennas of the VLBA, the scientists used German and Italian radio telescopes, as well as NASA facilities in California and Spain.